Crowdfunding is all the rage. Clean energy, especially solar, is about as popular as anything. Naturally, clean energy + crowdfunding = a win. We’ve written about a few clean energy crowdfunding opportunities and organizations over the past year or so (see the last section of this article), but the announcement today that Solar Mosaic is unleashing a solar crowdfunding site for the US is probably the biggest such news to date. Of course, Solar Mosaic isn’t new to solar crowdfunding — it’s been playing this game for awhile. But it’s new platform and behind-the-scenes relationships unlock a whole new can of crowdfunding opportunity. Of course, in recent years, residents have been able to invest in their own solar projects, and often land a handsome financial return. But that’s been about the extent of it. Now, starting in the exceptionally green New York and California markets, residents can choose to invest beyond their homes and businesses, putting their money into solar projects that are essentially guaranteed to give them a good return on their investments. Furthermore, they can know they’re doing a good deed in protecting human civilization from itself in the process — you can’t overlook that! Solar Mosaic, I’m sure, will be getting something out of the huge growth potential here. But my impression of the team since Day 1 has been that it is mostly looking to help the world. The fact is, banks and big-time investors are already taking advantage of the growing solar market and the need for upfront financing. And, in the US at least, much of the public isn’t getting a share of the cake. Solar Mosaic opens up the party’s kitchen to all of us non-banks and non-rich investors (or would be investors). “The transition to clean energy represents one of the greatest opportunities for wealth creation of our time. We created Mosaic to accelerate that transition by enabling more people to participate in it and to profit from it,” said Mosaic’s President Billy Parish. “Energy investing has traditionally been a bank only game, but already, hundreds of people from across the United States have invested to finance solar projects through Mosaic. We expect millions more to follow,” added Dan Rosen, Mosaic’s CEO. 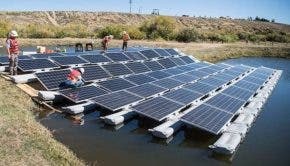 Solar Mosaic was actually one of a handful of companies to receive a good bit of money from the US Department of Energy to bring down the soft costs of solar power in the US. It received $2 million back around June of 2012 to develop the platform just launched today. Anyone who has worked in the media business for long knows that superlatives get people’s attention. Good PR people go out of their way to proclaim ownership of a good superlative or two. “For the first time ever, the American public will be able to invest directly into clean energy projects and receive a solid return,” Solar Mosaic noted above. I think that is true (and they probably know better than me), but as Solar Mosaic (and I) also pointed out above, is that it’s been organizing the crowdfunding of solar projects for awhile… just not as broadly. A reader also recently tipped me off to SunFunder, which looks like it is the first global solar crowdfunding project. Like Solar Mosaic, it is open to the masses — you can invest as little as $25. Anyway, we’ll write a full post focused on that company soon. Beyond these specific groups, we’ve posted a handful of articles on the clean energy crowdfunding floodgates that are waiting to open. We’ve reposted an article from CEO of Return on Change on this potential; as well as one from Jason Best and Sherwood Neiss, two champions who led the US fight to legalize debt- and equity-based crowdfunding, co-authored Crowdfund Investing for Dummies and founded Crowdfund Capital Advisors (notably, they mentioned Solar Mosaic in that article). And, following Obama’s signing of the JOBS Act, which included this critical opportunity, John Farrell wrote a great post on the potential for community power crowdfunding. Lastly, for now at least, our network (which has weekly Google+ Hangouts “On Air” led by Jeff McIntire-Strasburg, founder of sustainablog) recently had an On Air Hangout on the broader topic of crowdfunding “green” projects. The point of it all is: this is just the beginning, and with it being the beginning, we should have many more “first crowdfunding….” stories to share with you in the coming year or few. Since the news of the day is about Solar Mosaic, I’ll encourage you to head on over there to read more and perhaps even join the fun!